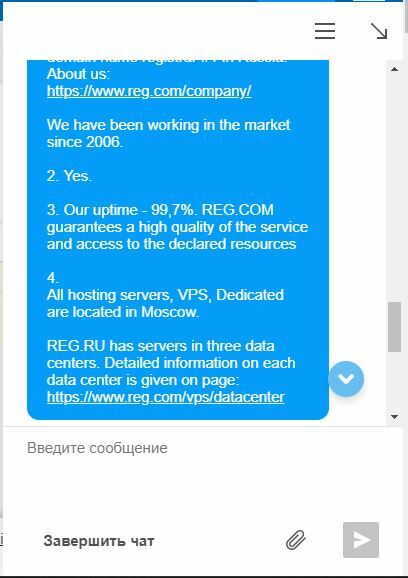 REG.RU Review 2019: Is REG.RU a Good Hosting? REG.RU is one of the biggest hosting companies in Russia with more than 10 years’ experience. It offers all types of hosting and web design solutions at highly competitive prices through a wide range of packages. With more than 1.9 million customers worldwide, REG.RU is one of the largest, if not the largest, hosting companies in Russia, especially after it was joined by Agava in 2017. It was founded back in 2006 and specializes in shared hosting, VPS hosting, dedicated servers, cloud hosting, and domain registration. The website is available in Russian only since, even though the company serves customers from all over the globe. All hosting plans come with the Softaculous installer, which is handy for both advanced users and beginners. It allows you to install all the important apps, such as WordPress, Joomla, Droopal, etc., in a single click. That said, advanced users won’t waste time in writing detailed scripts and beginners won’t need prior web building knowledge to create their website. The popular cPanel is supported on all hosting plans to provide you with effortless control over all aspects of your website, including additional domain registration, databases management, statistics, and almost everything else. REG.RU’s pricing system is divided mainly into Linux and Windows. The Linux packages are categorized into Budget, Speed, and +Power. Each has a range of different price plans to better fit your needs. On the other hand, the Windows packages are divided into Budget and Speed. All price plans mainly differ in the storage space among other minor differences. Considering the size of the company and the features offered, REG.RU’s overall prices are relatively cheap compared to the average market. There isn’t a clear refund policy, but there’s a 14-day free trial. REG.RU currently accepts PayPal, credit cards, and wire transfers as payment methods. Regarding the knowledgebase section, it wasn’t easy finding it on the website, but when I finally did, it was worth it. It has many useful tutorials including video tutorials and a comprehensive F.A.Q. section. There are three ways to get in contact with customer support: support ticket, phone and live chat. I fired my questions at the live chat support and I received instant response that was also informative, professional. All these are signs of a reliable provider. However, I would have preferred a more responsive support ticket system, but the live chat definitely compensated for it. Cheap prices, many inclusive features, and a reliable service quality are all what you can look for in a suitable web hosting company. REG.RU meets all these aspects. The only two things that can really improve its status would be providing its website in more than one language, and slightly organizing the information on the website to be easier to obtain. Get affordable and reliable hosting solutions at REG.RU. Wondering how REG.RU stacks up against other Web Hosting companies? Enter any other Web Hosting company and we will give you a side-by-side comparison.